I love this pattern, for it looks great on either side. It's a pattern from Debbie Macomber. In fact this particular blanket was mentioned originally in one her (Hannah's List (Blossom Street) books that I read this summer and I found the pattern in Knit Along With Debbie Macomber: Hannah's List. This Leisure Arts book has other interesting patterns as well. In the future I'll definitely be making this one again. It's easy, plus the pattern keeps you interested and it doesn't get boring. My sister, who visited me this summer, had a birthday in the beginning of October, so I sent her a little package. 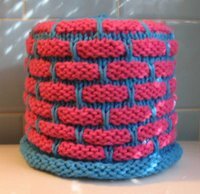 I made her a couple of my favorite dishcloths (ballband and DW), a toilet paper cover and a set of crocheted potholders. I included some notecards and chocolate. She seemed pleased. I also made a set of potholders for a friend. 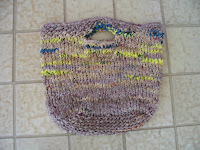 I used the same crocheted pattern. They make nice hot pads. Decorative and useful...a very good thing. I'm still reading listening to my audio books. I've really been enjoying Debbie Macomber's books. I've just finished the Blossom Street series and will start the Cedar Cove series soon. I've taken a little break from Debbie Macomber and I'm presently reading Room: A Novel. Initially I almost gave up on this book until I realized what it was about and then I had a hard time putting it down. Won't spoil it for you should you want to read it, but I recommend especially the audio version. If you are interested I've been keeping track of my books with Goodreads. Its ravelry for reading. Be sure and check it out as it is very clever! Miss Pink is no longer blooming. She made me quite happy for over 6 months and is now working on a new leaf. Hopefully she'll be nice to me and make me some more flowers. I've been feeding her, but not sure what else to do to get her to blossom again. I'll have to get her a new pot soon, too. One of my main distractions lately is my interest in my family's history. Encouraged by my sister, who is an expert in her own right, I've been bitten by the search bug and at some point couldn't help myself. I've found out some interesting things I didn't know. It's so much fun. It's like solving a big puzzle. Now I have to put it all together with the photos and documents I do have. Once again I wish I had more time to do it all justice. Not willing to make a promise I may not keep so I wont tell you I will post more often, but I will tell you I'll try not to wait so long in between posts. Guess I'm in a rut. Maybe my knitting is just not as exciting as it was before. 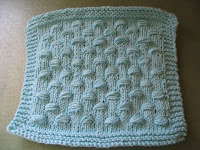 I'm still working on the circle squares (my only project on the needles right now) for my Pine Street Inn blanket. I'm not going to be able to attend the knit-a-thon this year and I'm not sure if I'll be able to finish all the squares in time to assemble the blanket in time for the knit-a-thon. I'm determined to keep all the squares together, so I can donate a finished blanket. Last year I almost had enough squares, but decided to donate just the squares i did get done. It was hard to see them split up. I had envisioned a blanket with just my squares. Do you remember the ones from last year? Hopefully I'll get it done in time to send in, if not it will be a little late. Better late than never, right? Your knitting is so perfect the blanket looks machine done! It's just gorgeous. I bet your sister loved her gifts. I love those flower potholders especially since I've been crocheting a lot lately myself. Thanks for the link. Sorry about your cactus - at least you have enough of it left to start over again. It's such a pretty one, it'd be a shame to lose it altogether. Genealogy? Cool. I hate doing the research myself, but my sister and our youngest are into that right now and are finding out some nifty information about our family, too. I'd love to hear about yours if you ever decide to blog about it. Have a great weekend! You're not a bad blogger...you're a busy blogger! I LOVE that blanket and those pot holders! I simply must learn how to crochet better!!! I think we all go through those stretches where we don't feel like blogging. Don't worry about it we will be here when you post. I really like that blanket pattern. And, of course, your knitting is beautiful. I agree with you about reversible patterns for blankets. It's especially important if they are gifted to non-knitters. Otherwise, invariably, a non-knitter will wrap their babe with the "wrong" side out! Darling baby blanket. I need to look for the pattern. If the cactus is budding, I think it will survive, but it may take a while. Genealogy is a lot of work, but it is satisfying. Sometimes life is just more important than blogging, but I sure do enjoy when your blog gets a new post. The projects are all so cute. I love the baby blanket. great baby blanket ! my crazy pink Christmas cactus is blooming now ! and joined the DAR, Daughters of 1812,and now trying to join Daughters of Union Civil War Veterans. Who knew all those ancestors were there? That blanket is just beautiful!! Our Christmas cactus blooms at the strangest times. I think it's dying and then all of a sudden it starts flowering. So sorry about your beautiful Christmas cactus - hopefully it will come back to life for you. Your niece's baby's blanket is outstanding. That's quite an accomplishment as it takes some time to do a blankie. I do love the colorway you chose for your sister's b-day gifts. Love the pieces you made her, too. Uh-oh, that ancestry bug bites hard! It's so fun, though, isn't it?! I learned I have some Cherokee blood in me and we learned from my DH's step-sister that they also have some Cherokee in them. I was disappointed that my siblings were not very interested in our roots. I guess we go thru different phases at different times??? Oh, well...enjoy investigating your family history! 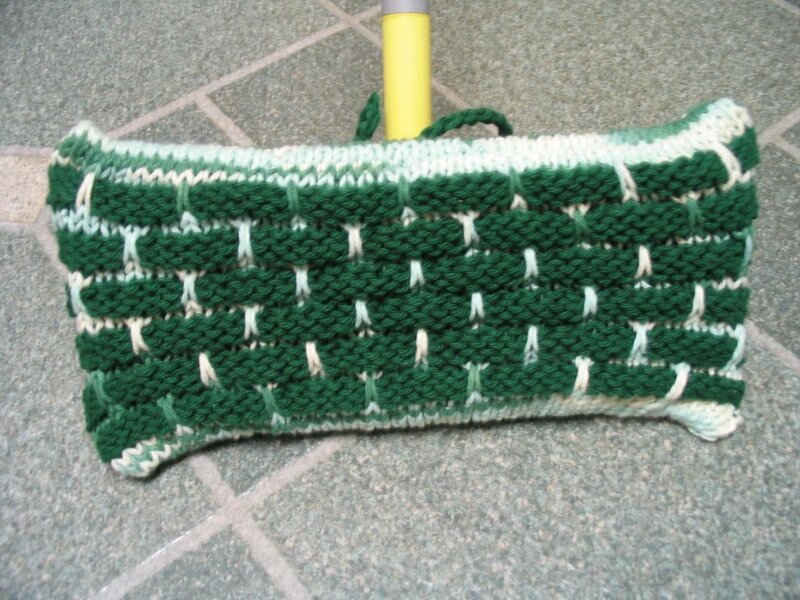 I love your knitted items, those pot holders are really cute. I started to read Cedar Cove and then I got side tracked and I can't remember which one I was on. Good characters, you'll enjoy them. Love the blanket, don't remember the pattern, must look again at my Debbie Macomber stuff to see if I have it. I've done my family history too, so understand your interest. It takes lots of time, but is very fascinating. hmm, for some reason, google reader hadn't kept your older posts for me (i knew there were more than 2 posts of yours i hadn't read yet!). the blanket looks stunning (as per usual!). you didn't like Room initially?? I devoured it! lol. Good to know you are on goodreads. I am too. :) Will add you as a friend! did miss pink sprout some more flowers for you? i hope so. how did your christmas cactus fare?